In 1845, Michael Faraday in his laboratory at the Royal Institute, discovered the magneto-optic effect. He observed after trying many subjects as media, that polarized light traveling through a substance which is exposed to a strong magnetic field will have its plane of polarization rotated. 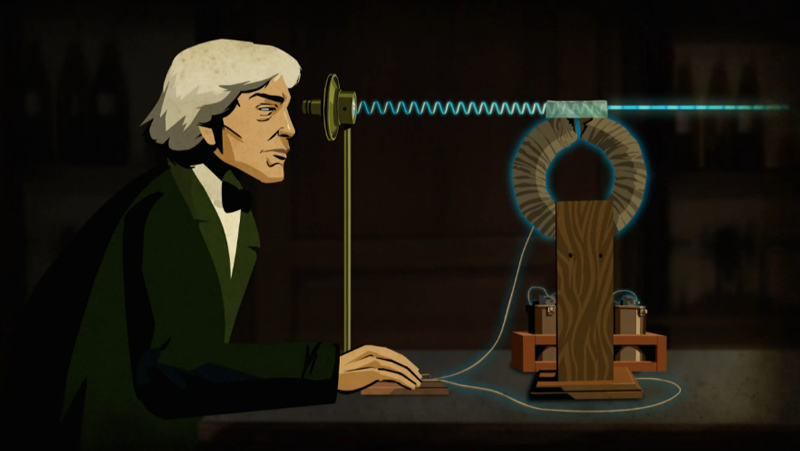 This effect was later named after him: The Faraday Effect. The importance of this discovery is that it demonstrated for the first time a relation between light and electricity and magnetism. The amount of rotation of the plane of polarization depends on three things: the magneto-optical properties of the material that the light traverses, the length of the path of travel through the material, and the strength of the magnetic field. In addition, the magneto-optical properties of a substance are dependent on the wavelength of the light and the temperature of the substance. A single value can be attributed to the magneto-optical properties of a material at a given temperature acting upon a specific wavelength of light. Under what circumstances might the temperature of a substance NOT remain constant? What difficulties would this present in trying to assign numerical values to the magneto-optical properties of a substance? Or in measuring the angle of rotation? 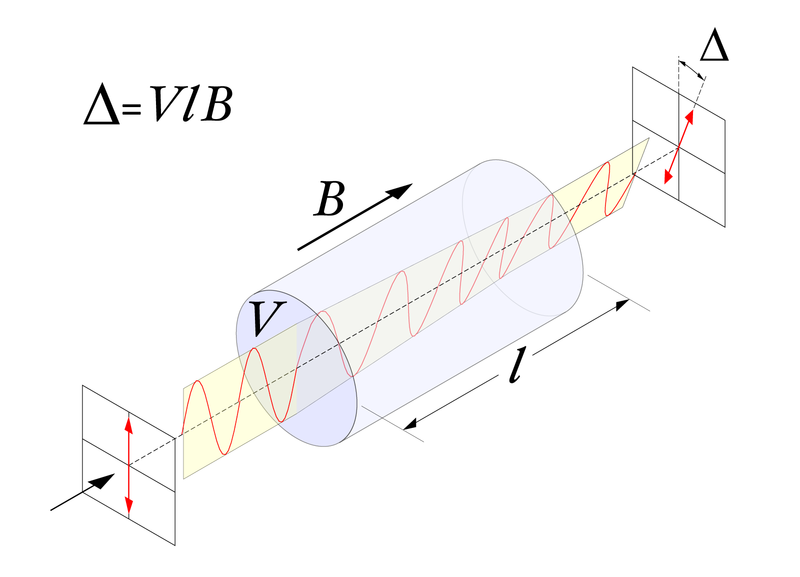 The magneto-optical properties of a substance at a given temperature and interacting with a given wavelength of light is called the Verdet constant. V radians per Tesla meter (rad)/(T)(m) the magneto-optical property of the substance for a given wavelength of light and temperature is named after the French physicist Émile Verdet. Visually, Faraday Rotation can be conceptualized below. Incoming light at a single wavelength enters from the left. Imagine that it is polarized nearly vertically (zero degrees). It enters a substance that is ℓ meters in length and with a Verdet constant of V. Along the direction of travel the magnetic field strength is B Teslas. How would you approach calculating the angle of rotation for light traveling through different layers of several substances (assuming everything else was constant)? Consider, for example, a stack of glass plates with different optical properties. What happens to a light beam that travels through a substance with blended wavelengths? Suppose that you have a lab apparatus with known physical parameters of Δ, V, ℓ, B. If you doubled the magnetic field strength, what would happen to the angle of rotation? By what measure would you have to increase the field strength in order for the angle of rotation to come full circle? (That is, an angle measuring Δ + 2π radians) ? Can you think of a procedure you could employ that would determine if the angle of rotation was simple, or a multiple addition of 2π ? Consider that some materials are opaque to light in the visible spectrum. Can you think of any applications involving non-visible light, such as x-rays? Druyan, A., Sagan, C., & Soter, S. (2014). The electric boy. In Cosmos: A spacetime odyssey. Suchat, S., Viriyavathana, P., Jaideaw, P., Haisirikul, N., Kerdsang, W., & Petcharavut, S. (2011). Progress in electromagnetics research symposium proceedings. In Measurement of the verdet constant in different mediums by using ellipsometry technique (pp. 803-806). Suzhou, China. Shakir, A. A., AL-Mudhafa, R. D., & Al-Dergazly, A. A. (2013). Verdet constant measurement of olive oil for magnetic field sensor. International Journal of Advances in Electrical and Electronics Engineering, 2(3), 362-368. Retrieved from http://www.sestindia.org/volume-ijaeee/.